“There is no getting better,” my brother assures her. “I am finished with her,” ma announces, hanging up on her sister in Montana who won’t come say a final goodbye in person. Their relationship fixed years ago when ma called collect from a hospital bed: her sister—fearing a scam—refused the call. Their relationship fixed years ago when her sister refused to come to my father George’s funeral. I always knew my violent concision came from ma’s bluntness. In these final days (daze), I am finally hearing the lyricism of her syntax. “Do you wish you had a sister?” she asks me. She hadn’t had a smoke since 1976. She hadn’t worn a diaper since 1932. It took two of us to keep her dry. “Do you have money?” she asked. Ma is asleep in her red leather recliner. My brother is in the bathroom. Mormon news is blaring on the television. I’m on ma’s couch remembering the weeping at Marthe’s memorial—an event where we were forbidden to mention anything religious or medical. For solace, I hover over page 17 from Marthe’s last manuscript: deposition | dispossession climate change in the Sundarbans. I get up to wash a plate, walk behind the couch to the sink. There I see it again: the family photo we had printed on a blanket. Mom (age 5) poses next to her older brother and two younger sisters. Mom’s hands hold the tinier hands of cousin X (age 2)—a toddler ready to walk away from the camera. There is, in almost every segment of Ai Wei Wei’s film Human Flow, a toddler trying to walk away. There is, on every continent, hundreds of thousands of family units trying to get better by fleeing trauma. My brother, for once, has left the turquoise chair and actually walked out of the apartment. “Why doesn’t Mark like people,” ma asks. “He doesn’t like people?” I am confused. “What are you doing?” ma asks. Again, I am the silent one. Neither ma nor I ever met Dagny; dad’s mom was dead before ma married. Any pride is a fiction. A tale we tell to fill an absence. It has been over a month. Ma has not had another stroke, so my brother opts to return to New Orleans for a week. Suitcase in hand, he says goodbye to ma. “I hope you don’t have to come back,” she says. I think: she’s ready to die without him here? Call me, dear friend, if you would like. I love you. Marthe, Can't call now. Too awkward. Exploring a tangled, unsettled love for place amid the landscape, cultures, and social and ecological crises of South Louisiana, ARK HIVE seeks amid the ruins for answers—what does it mean to be here, now? Following the ley-lines carved out in the streets and bayous of a rapidly eroding landscape, this collection refuses stability, confident of only the riddle and the manifold voices activating it. Reed’s formal hybridity juxtaposes hand-made maps, collaged language, and altered documents with lyrics and lyric essays: “fragments [from] journals, photographs, memory, archives—time capsule of a disintegrating world.” ARK HIVE bears its loves and dead along the current of the work’s own profligate vegetative urge—accretions of history and immersion, saturations of grief and delight. Tender and monumental, a teeming hive of voices, ARK HIVE returns an extraordinary, vanishing world to the center of our attention. This is a brilliant portrait of your ARK, your HIVE. You map the book and your process well. I particularly LOVE the last line. And the ley-lines carving. And unsettled love. Maybe consider these two tweaks: Start with the question. What does it mean to be here, now? Exploring a tangled...amid the ruins for answers. Quote some other passage. Your list of the hybrid's modes of discourse is accurate and compelling. The citation is a little repetitive until we get to “time capsule” and “vanishing world.” You want to save the vanishing until the last sentence. Safe travels home Marthe. It must be sad to leave. Not sure when I will be back in NY: mom had a stroke early Friday morning. Her care needs have intensified. I have committed to staying here until she dies. Oh Lori, a hard, hard time. Love to you. Hi Lori, I’ve been thinking of you and your mom. How is she doing? How are you? Hawaii...just an airport or on a beach? Mom got her language and motor skills back within 2 days. Then the following two days she slept round the clock. Today, though, she got out of bed and took her walker outside her room and down the hall. Found myself reading Kurzweil and Vinge on machine sapience and the technical singularity. And a book called the Most Elegant Equation in which I had to relearn notions of the limit. When are you home home? I get home on the 4th. We are on the Big Island with Susan Schultz and Laura Mullen. Snorkeling and hiking. Good news about you mom!! Creator/collator Lori Anderson Moseman’s most recent poetry collections are Light Each Pause (Spuyten Duyvil, 2017), Flash Mob (Spuyten Duyvil, 2016),and All Steel (Flim Forum Press, 2012). Her books Y (The Operating System) and DARN (Delete Press) are forthcoming in 2019. An avid collaborator, Anderson Moseman worked with book artist Karen Pava Randall to create Full Quiver (Propolis Press), with poet Belle Gironda make Double Vigil (Lute & Cleat) and printmaker Sheila Goloborotko to produce insistence, teeth (Dusie 17) and Creation (Goloborotko Studios). With a nine-member team of artists and writers (Stricker, Herrera, Mesmer, Switzer et. al. ), Anderson Moseman created Mar, an artist book/box of mar(k) postcards (Lute & Cleat). A former educator, farm journalist and forester, Anderson Moseman founded the press Stockport Flats in the wake of Federal Disaster #1649, a flood along the Upper Delaware River. This series of small encaustics were constructed in the Hudson Valley’s R&F Encaustic Studio. Their abstract subject matter is culled from materials I was able to scavenge from my Red Hook, Brooklyn studio after it was flooded. Flotsam and jetsam of past work literally floated to the surface of the waters, and in so doing, gave me the (unasked for!) 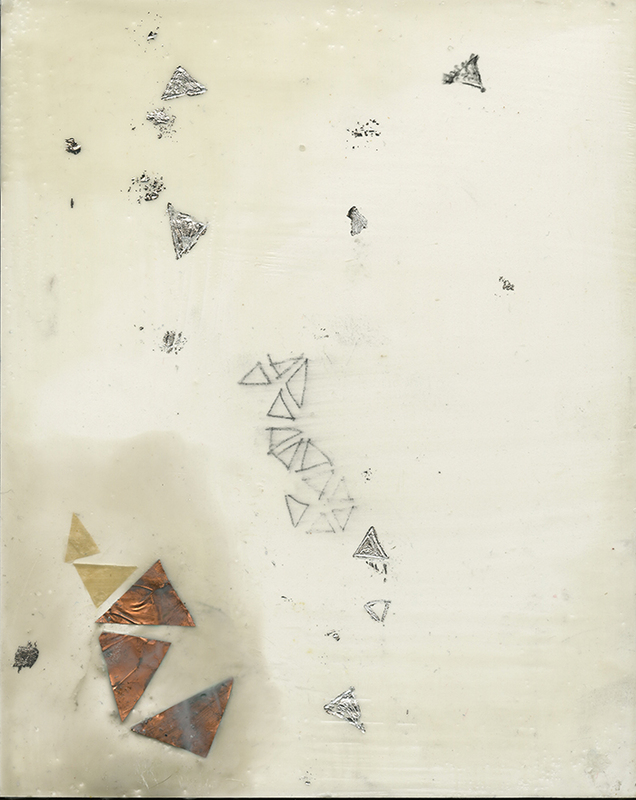 opportunity to see, before me, geometric fragments from cutout copper plates, old, damaged prints, and the like. In this series, they float in wax, a material used for centuries for its preservation properties—and the drifting compositions are evocative of weather, life-cycles, and elemental forces. Sheila Goloborotko engages in a restless, relentless material practice that allows singular ideas to emerge in the guise of numerous artistic actions like characters that reappear in novellas over time, or seeds that are blown ashore and thrive in diverse climates. This multidisciplinary artist and master printmaker has exhibited installations, works on paper, sculpture, videos, and interactive projects in more than 150 exhibitions in museums and galleries on four continents, and yet has remained firmly committed to community. Her printshops in Jacksonville, Florida and in rural Pennsylvania are sites of print and poetic activism, empowering first-time printmakers with hands-on workshops and developing the visions of mid-career artists with portfolio production and instruction. An experienced academic who thinks outside the box, Goloborotko is currently an Assistant Professor of Printmaking at University of North Florida. She is also the founder and director of Goloborotko’s Studio’s since 1989, a center for production and diffusion of printmaking whose principal goal is to encourage the voice and vision of individual artists in a nurturing environment that supports the creation of works that push the boundaries of printmaking.